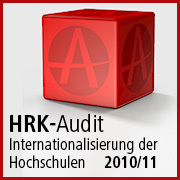 The FAU was one of the first German universities to participate in the HRK Internationalisation Audit and was successfully certified in 2012. In the course of the re-audit which began in November 2015, FAU has made a commitment to develop internationalisation strategically across all areas and levels of the university community. The re-audit focuses on the sustained support and development of international research contacts and cooperations in the major research areas, improving the quality of structures and services and the strengthening of the existing networks and partnerships (with universities, industry and research institutions). We could not find any entry with the given search term 1257404.